Every time we take a trip, it seems like we’ve traded one type of experience for another: Green vineyards or blue water? City or countryside? Yet somehow Gimmelwald had it all without any of that. It’s hard to explain the duality of it’s existence, but it feels simultaneously like the oldest place on earth yet still undated. We reached Gimmelwald by a 2 hour train ride from Geneva to Interlaken, transferred to another train to Lauterbrunnen, caught a bus to Stechelberg, then took a gondola up the mountain. The gondola provides instant access to the village, which sits on a shelf on the side of a mountain at 5000 feet, overlooking a valley with dramatic waterfalls all around. It feels like the essence of the world is being created in this valley; behind the largest mountains in the alps, which sit across the valley, lies one of the most extensive collection of glaciers in the world. Gimmelwald is a balcony seat view to witness the awe of nature. Maybe it’s due to the obvious seasons that are experienced in the area as the year goes by: the town is buried in snow that accumulates for 6 months of the year and as the Spring comes, starts to melt, bringing the orchestra of waterfalls and the river rushing into the valley floor. Summer comes and the cows are returned to the “Alp”, a name that specifically refers to the higher parts of the mountains above the treeline where only grass grows and the cows graze for the summer. When the weather turns cold after a couple of months, the cows are brought back down to the village with a large “desalpe” celebration. They are kept in the pastures around the village that had been growing grass all summer, some of which was turned to hay for feed through the winter. The whole village is on the universal schedule dictated by tradition. The activities of the year evolve as though it’s written in stone. We check into our guesthouse and take a quick hike down the road under the fading sun. Back in the cozy warmth of the house we chat with some of the other guests in the communal kitchen and then cook a big meal to get ready for a full day of hiking ahead. Sounds of water falling thousands of feet echo off of the canyon walls and we fall asleep with that noise and are greeted by it again in the morning. We woke up before sunrise each of the three days of our trip. The muffled siren bringing the first gondola of the day sounds alien and oddly mechanical in this environment. The ski resort and prime destination of Murren is one gondola stop up the hill from us and we’re grateful that it attracts the majority of tourist in this area. We hiked for 6 to 8 hours each day and had a love-hate relationship with our hiking trails. The trails were tough (though labeled by the Swiss as “medium”, we now know that anything labeled as a “mountain route” brings serious heights and the need for sure footing), but we were rewarded with a display of the most magnificent natural beauty we’ve ever seen on a hike. 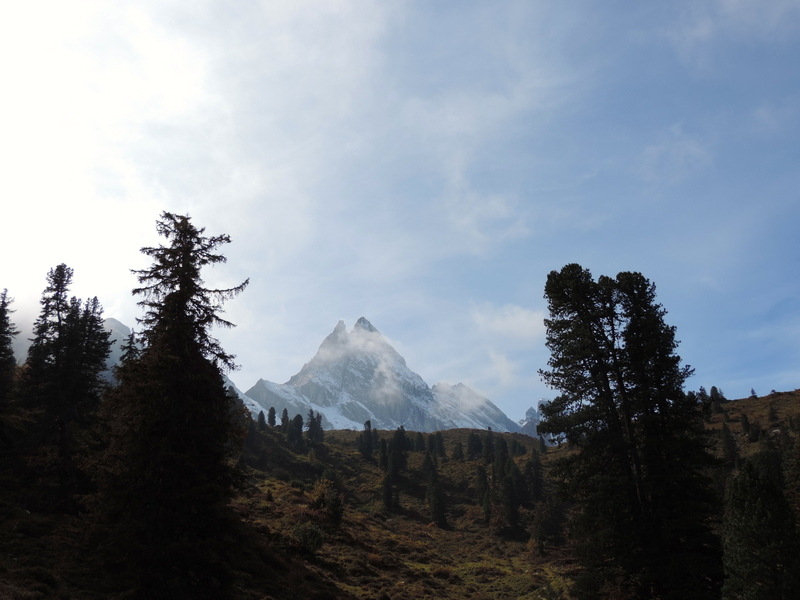 The hike itself was a largely private moment with nature experienced in full view of the towering mountains. The trails are mostly empty and any hiker encountered on the trial is acknowledged with a “Bonjour”, “Halo”, or just “Hello”. We saw more cows (12) than people (6) on our first hike, on a beautiful mid 60s Saturday with a clear-blue-sky. The hike took us down from Gimmelwald into the valley below and along the completely transparent blue glacial river. Heading along the river, we eventually took a steep hike and then wandered off the trail to the ledge of land above Gimmelwald. We make it just in time to see the sun coming over the tall fence of mountains, illuminating the village below us and creating an almost surreal halo effect over the mountains. Rick Steves told us that Gimmelwald would be heaven. You feel alone on the trail but there is a mountain hut or restaurant at least every 3 hours so that you can hike for days without packing food. We stumbled on one about halfway through our trip, at the base of the Schiltorn. The evergreens have given way to grass and marmots. Up ahead we can see the trail takes a very steep turn into rocks and gravel. We distantly see hikers on the mountain in front of us and think that it’s a good time for refreshment. Two Swiss women are operating this outpost in the middle of nowhere. We order a milkshake and ask if the milk is from here. No, they reply a bit forlornly, the cows are not up here anymore…it’s from the town below, where the cows are. Local sure takes on a different meaning out here. Sometimes people get themselves into trouble in nature when they underestimate it, and after hiking up for 6 hours and then glancing down on the top of the ridge, straddling the top of a mountain, I realized that I might be one of them. I had brought this on myself I thought. Some people might want to walk nonchalantly across and hope that time slows down so they can enjoy the view for a while. I wanted to run as fast as I could off of there. I wanted to sprint to solid ground. But it was either hike back the 6 hours, or continue on to the top. So we crawled for stretches, sat and caught our breath from the weariness of altitude and fear, and continued. The Swiss mark their trails amazingly well, which was a lifesaver. They use bright yellow arrows to point you in the right direction on ambiguous paths, and they paint the rocks and trees in between with white and red stripes every 10 feet or so, so that every time you doubt whether you can go on, you just have to make it to the next marker. It also makes it easy to point out the “trail” we hiked to get to the top of the Schilthorn – do you see that red and white stripe on top of a ridge where it seems like only an Ibex would walk? From a distance, we looked at that trail and decided there absolutely must be a hidden trail back behind the mountain that would take us to the top because there was no actual trail on top of the ridge, just slushy snow and a 10,000 foot drop on either side. We were wrong. We made it to the end: a platform and rotating restaurant at 10,000 feet that served as the set for the 1968 James bond movie On Her Majesty’s Secret Service. There were friendly faces on the trail but we were greeted with cold faces on the platform, a striking contrast from being enveloped in nature to viewing nature from through a glass case. However, nature can be overwhelming. It’s a force to be handled carefully and if you mistake it for a pretty, static picture, it will painfully remind you of the truth: looks can be deceiving. But here we realized a long-time truth, among the selfie sticks and iphones and “no high heels” signs: we’ve turned to technology to bring us happiness and use it to comfort us but it’s in fact hidden us from the essence of life. At that point when you’re scared to death and realize that there’s nothing you can do but hope it works out – that’s the real life that we all experience. It only comes into focus at extreme times, when you glimpse the how harsh the world can be. Maybe it’s actually that our sight becomes focused during these moments. A cure for the nearsightedness of our daily lives, every so often the realization comes into focus that life is filled with all these silly little desires that get washed away at the confrontation of something authentic. Life’s not complicated: it’s about family and relationships and concentrating on putting your foot in a stable place, grabbing a stable rock, and pushing forward. Keep moving. We are hidden from this simplistic truth, that this is what matters in life. We washed down those thoughts with a celebratory beer in the rotating restaurant, took some pictures and found the gondola for the easy way down. After a hearty meal of pasta and a short night, we woke up early again to set out for another 6 hour hike. Our muscles moaned but the promise of more treasures was too much to resist, so we set out in a different direction this time across the river and up the other side of the valley, over a modest mountain (relative the others in the area), then over the top, around the side and to a glacial lake. The day started out well and it was a beautiful journey; but once again, we reached another scary trail. It was about an hour stretch of the 1-foot wide trail that went along the side of the mountain. This confirms that the Swiss are part goat. To our left was the edge, dropping 5,000 feet straight down (as shown from our spot on the trail in this picture – even the houses at the bottom are too small to see). Several cautious people had passed us going the other way and seemed to have survived easily enough, but we had had our fill of heights without railings the previous day and the thought of having to come back this way removed our desire for another adventurous hike. And good thing we did, because moments later a massive instantaneous cloud enveloped the entire trail. We hiked back to Gimmelwald and caught the next cable car, bus and train to Interlaken, where we were spending our last night. Interlaken literally means “between lakes”, which sounds so much nicer in German and is a hub for many of the area’s activities. It’s a pretty town but being surrounded by so many tourists and material goods was a big shock after such a remote weekend. The best thing about Interlaken is its startlingly blue glacial river flowing between the lakes. At 9pm our bodies gave in to the exhaustion of the hikes and we turned in for the night. But the next time the weather is nice in the mountains, we are heading back to Gimmelwald.